Designed by Mary Beth Temple for Sweet Georgia Yarns. 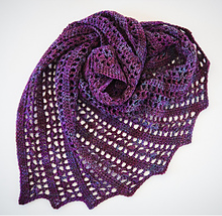 Delectably light and lacy, this gorgeous shawl, with an easy four-row repeat, is an instant favourite! Starting at the smallest point to emphasize the wrappable curves, it’s a perfect project for using up all of your yarn.